Yordie’s Zen Garden was located in the center of a bamboo forest with a beautiful mountain water source feeding a large meandering pond. 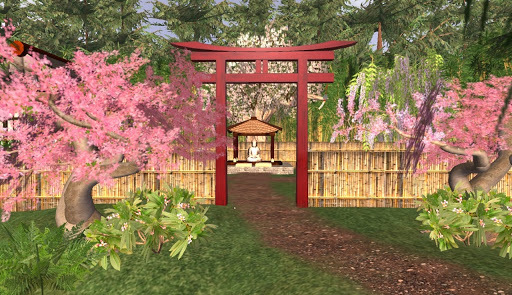 And as always, we’ve striven to create an environment that is very consistent with the spirit of the Japanese garden but in addition to a stroll thru the garden we’ve added a path that leads toward a small village with stores and residences. This is where it all began for me, a tiny Zen garden and it will be part of every region that bears my name. Come find serenity and beauty in my garden. Naturally, Yordie’s Zen Garden remains the primary feature at the environment, but it occupies only a small amount of space. Features from the old garden are still here, like the Harvest Moon Cafe, but there are many new features including a romantic pavilion sitting on a tiny island in the center of the new Meandering Pond. Also, there is a magnificent pagoda standing high in the mainland sky. 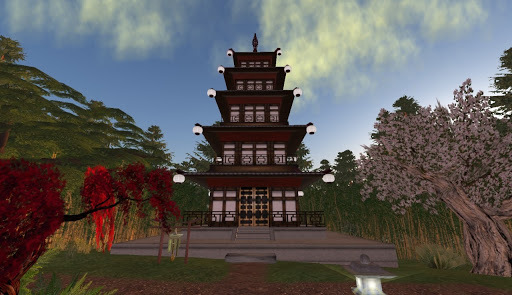 This pagoda was designed by Effulgent Brown, one of SL’s great ladies. Eff has had to leave Second Life again to contend with an illness. This pagoda is a tribute to her.